The iGroove SXT from Klipsch is an iPod player and charger. It is compact, attractive, and does not play music at ear-splitting levels. On the contrary, one of its most delightful characteristics is that it will play music at moderate and lower volumes with balance, clarity, and a life-like resonance. A lot of small units in this category are shrill or tinny in the higher treble notes, no doubt the result of cheap tweeters.That does not apply to the iGroove SXT. What I like about the iGroove is that it’s a perfect size, both physically and in terms of the decibels it produces, for use in my office. I can listen to music low enough so that it does not intrude on those in nearby offices, but without sacrificing quality. I also liked the iGroove’s price ($149). It comes with an S-video port so that if you have video on your iPod you can watch it on a TV (you’ll need to buy the S-video adapter). It also has an auxiliary port that enables you to connect another device — a turntable, for instance — and listen to the output through the player’s speakers. Again, you’ll need the earphone adapter. I own a Bose SoundDock which I bought a few years ago at a cost of more than $400. The Bose sound is fuller and richer than the iGroove. I can crank it up in my bedroom and hear it out in my carport. The sound is excellent, but the retail price is roughly three times that of the iGroove. And the reality is that it’s a lot more power than I can realistically use, especially when there are other people in the house. When I listen to my iPod player, I may be in the next room or I may take it outside when I’m washing my car. I’m never all that far away from the sound. Under the circumstances, quality speakers are more important than the power to make a dance hall jump. The iGroove does not produce the kind of volume or bass that would make your car bounce when you’re listening to your favorite rap music. On the other hand, the resonance and power are perfect for a dorm room or for anyone who really prefers to hear music at a volume that will not lead to a hearing impairment. If you like classical music, listen to a piece for solo violin and you’ll be amazed at how faithfully the sound is reproduced. Another important factor in the quality of the sound coming out of the Klipsch speakers is the way the music was originally recorded to your computer. If you transfer a CD to iTunes at a lower or higher bit rate, you end up with either a lower or higher quality of sound. A lot of consumers can’t hear the differences between the bit rates used in an MP3 recording and those in an Apple Lossless recording. These are matters best left to audio engineers. The bottom line, however, is that if you have a poor recording, neither the iGroove SXT nor an expensive Bose is going to make it sound great. •	Impervious to cell phone interference. •	Works with any iPod or iPhone with a 30-pin connector. •	iPod shuffle and other devices connect via auxiliary input. •	Instant wake functionality when using your iPod’s alarm clock feature. •	Quickly recharges the iPod, iPod touch or iPhone. 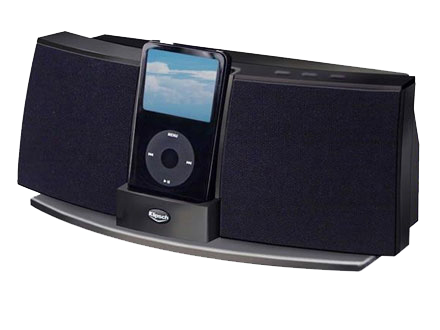 •	Includes two remote controls, power adapter and power cord.